BB Cream Korean: How to get rid of frizzy hair. I will love to get rid of dry, frizzy hair either but frizzy hair seems to love me very much! It doesn't want to leave me at all, no matter how much I've tried to push it away from me lol. As many of you emailed me regarding messy, dry, frizzy hair, I decided to just do up a post for all of you! Although it's almost impossible for me to get rid of the frizziness in my hair, there are some ways I've tried that managed to tame my hair and make it less frizzy. This is the MOST effective way although it doesn't last very long. I love the result from hair treatments because my hair looks almost near perfection after it lol. SMOOTH + MANAGEABLE + NO FRIZZ which is exactly what I've always wanted! It will usually last me for about a week! I went for a shoot for my shop a day after I did hair treatment and as you can see from the picture above, my hair looks really smooth and frizz-free! I do my hair at SALON VIM - and I've been loving their PRIVY HAIR TREATMENT because I swear (not because I'm sponsored or anything) that is the most AMAZING treatment I've ever done. Nay side when it comes to hair treatment in salons is the high maintenance as you will have to go back regularly to keep your hair frizz-free but it's also the most effective way to keep your hair smooth. I haven't try any other ways that works better yet so if you're desperate - this is it. 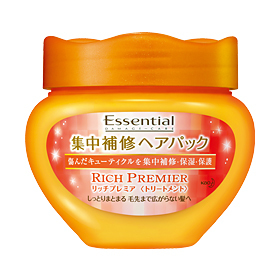 I use KAO's Essential Damage Care Hair mask as it's one of the best hair mask that I've been using even before I got a hair sponsor haha. Probably one of the most promising hair masks I've used. On top of that, it smells really yummy haha. Anyway, hair mask is the way to go if you have a tight budget but want to have nice frizz-free hair. The way you use your hair mask is very important as it affects the result! When I started using hair mask, I apply a little bit on the ends, clip all my hair up and wait for about 10 minutes before washing. That didn't really work out so well (although it still works to a certain extent). We all know how stubborn frizzy hair can be at times!! Now, I'm using my hair mask EVERYDAY. I'm sure you're not recommended to do this but my hair is quite dry so I do this daily. After that, I will wash the hair mask off using COLD WATER or room temperature water, depending on what you like to call it haha. NOT the heated hot water. This helps to keep the goodness in your hair!!! Salon Vim gave me a bottle of L'Oreal's Mythic Oil so I've been using that for quite some time already. I apply it every time after I wash my hair and before I head out of my house. If I were to blow dry my hair, I will apply it before and after blow drying! And lastly, if all else fails.... EMBRACE THE FRIZZINESS LOL. Thanks for reading and do let me know your ways of reducing the frizziness in your hair, if you have any!